Early-age Thermal Cracking, usually termed as Early Thermal Cracking is a phenomenon in concrete structures, caused by excessive Tensile Strain in a concrete section above the Tensile capacity of concrete as a result of restraining thermal contraction or due to differential temperature within the cross section. Concrete casting condition like; cast on grade, cast against wall etc. The principle cause of Early Thermal Cracking is the release of Heat of Hydration from the binder, usually cement paste in concrete. Heat of Hydration causes differential expansion within the section leading to an internal restraint or an external restraint which will restrict contraction during the cooling or curing. ETC can be evident in thinner sections within a few days or casting. For thicker sections, it may take longer to develop cracks as the cooling is gradual. The process of early thermal cracking is complex and in order to attain a procedure for design it is essential to make a number of simplifying assumptions. 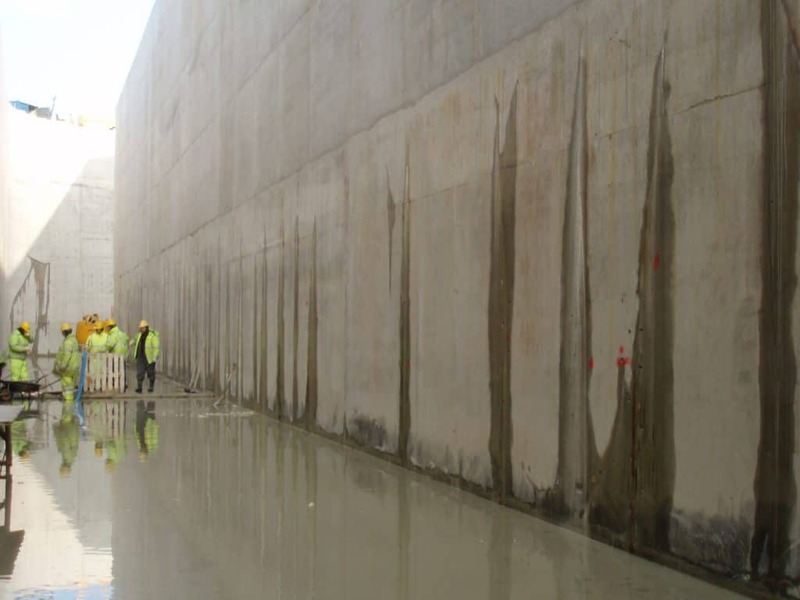 During initial stages, the heat generated during the hydration of cement is at much higher rate than the heat loss to the atmosphere, increasing the temperature in the concrete. Further, the rate of heat loss becomes dominant allowing concrete to cool and contract. If the concrete is considered to be unrestrained and completely insulated, preventing any differential temperature in the c/s, it will initially expand and later contract without inducing any stresses. Which is not practical to achieve, hence there is always a stress generated due to partial restraint. The restrained concrete will induce compressive stresses during heating which is relieved during cooling. Moreover, the rate of change of elastic modulus is high during initial days, and much higher during the cooling stage than heating stage. The compressive stress during heating is lesser than the tensile stress during cooling, for a given magnitude of restrained thermal strain, this results in residual stress at the end of hydration. It is difficult to calculate the stresses developed during the early thermal cycle because of the rapidly changing elastic modulus of concrete and altering influence of creep due to the young age of the concrete and the accelerating effect of temperature, can cause significant relaxation of induced stresses as shown in Figure. The compressive stresses resulting from external restraint are unlikely to cause any cracking but if the tensile stresses are excessive, cracking occurs. 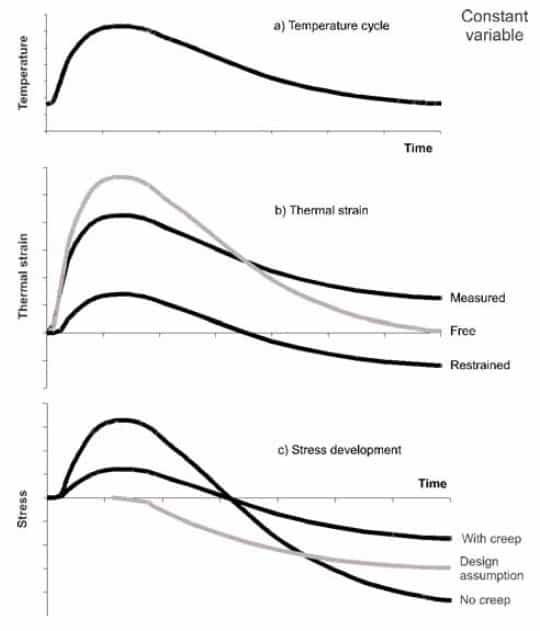 It is generally assumed that for conditions of external restraint, compressive stresses induced during the heating phase are entirely relieved by creep and tensile stresses are induced during the cooling phase from starting from the time of the peak temperature (refer design assumption line). To simplify the design process a strain based approach is assumed in which the restrained tensile strain induced during the period of cooling from peak to ambient temperature is compared with the tensile strain capacity of the concrete. When differential temperature causes cracks in thick sections, due to internal restraint, the assumptions employed will differ. Tensile strain at the surface may be caused by restrained contraction (if formwork or insulation is removed letting rapid cooling of surface) or due to expansion of the core of the section, which achieves a higher temperature rise and thermal expansion than the surface. In both cases, for sufficient tension to develop at the surface, compression must be developed at the centre of section. In this case the assumption that all compressive stresses are relieved by creep is no longer conservative. In this case temperature T1 is replaced by the centre to surface differential temperature ΔT and a value of restraint R is derived from shape of temperature profile along thickness. Cooling concrete before placing or in situ. In some cases the restrained tensile strain developed may be insufficient to cause early age thermal cracking but may contribute to strains that cause cracking in the longer term and it is important to recognise the significance of these residual strains within the design process. Early Thermal Cracking reinforcement requirements as per BD 28/87 Prediction Method.